Gigabyte has made its way into the top ranks of the motherboard industry and today, they are unveiling their next generation high-performance X99 Gaming G1 WiFi motherboard for Intel’s Haswell-E processors. The X99 chipset powered motherboard comes with a variety of features which include the G1 Gaming design and Ultra durable PCB components which assure you get top notch stability and performance out of this high-end product. The Gigabyte X99 Gaming G1 WiFi motherboard comes with the LGA 2011-3 socket which will be able to support Intel’s next generation Haswell-E processors. The Intel Haswell-E lineup launches on 29th August 2014 and will include three processors; Core i7-5960X, Core i7-5930K, Core i7-5820K. These processors would be built on the Haswell microarchitecture featuring better IPC performance and power efficiency while delivering improved performance compared to previous generation Sandy Bridge-E and Ivy Bridge-E processors. The Core i7-5960X would also be the first native 8 Core processor from Intel operating at a TDP of 140W. The motherboard sticks with the G1 Gaming design scheme we saw on the G1 Gaming WiFi Black Edition which keeps the bulky design intact. It comes in a red/black/silver color scheme and uses four sets of heatsinks, three near the LGA 2011-3 socket for PWM, VRM cooling and a larger PCH heatsink which cools off the X99 chipset. The heatsinks are interconnected via large heatpipes which run across the surface of the PCB dissipating heat off the components for load optimization. The color scheme is a good touch and we expect to see more boards in the future from Gigabyte including their X99 SOC Force. Moving onwards, we have a 8 Phase PWM design featuring high-quality Ultra Durable MOSFETs and black solid state capacitors. The LGA 2011-3 socket is powered by a 8-Pin connector while the motherboard is powered by the 24-Pin ATX connector. The LGA 2011-3 socket is coupled by eight DDR4 DIMM slots (four at each side) and capable of supporting dense memory sticks with speeds beyond 3000 MHz. There are a few overclocking features next to the DIMM slots which include voltage check points, slot disable switches and a Diagnostic LED. Expansion includes four PCI-e 3.0 x16 slots and three PCI-e 3.0 x1 slots. The motherboard is capable of supporting 4-Way SLI and CrossFire thanks to ample spacing in between the PCI-e Slots. There’s a mSATA connector and a mPCI-e connector in the middle of the PCI-E slots which enables 802.11 B/G/N WiFi support. Storage includes 10 USB 3.0 ports, 2 SATA Express ports. two USB 3.0 headers, two USB 2.0 headers and a PEG connector next to the SATA ports for additional power. Several features could be spotted on the motherboard which include a Sound Blaster powered isolated PCB which uses high-quality components and OP-AMP for superior audio quality through the 7.1 Channel audio jack and Killer E2200 LAN chipset for networking support. 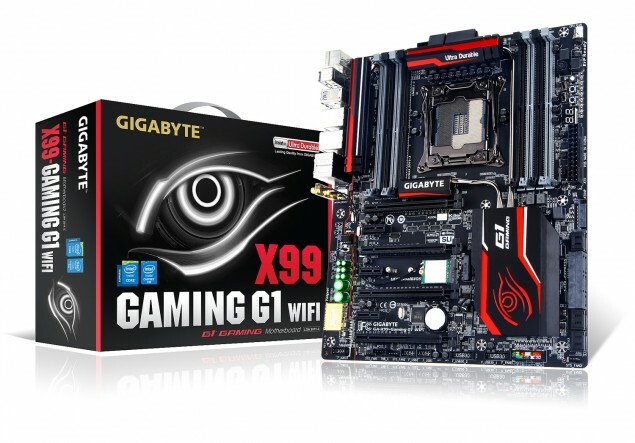 The Gigabyte X99 Gaming G1 WiFi is a high-performance motherboard for enthusiasts and gamers. The I/O panel features several USB 3.0/2.0 ports, LAN port, Antenna connectors for WiFi, 7.1 Channel audio jack and a few more connectors. The motherboard will retail at a price above $300 US once it hits the market later this month.